You take this character who’s fronted The Misfits, done some WCW wrestling, toured the world with The Misfists, toured the States with his solo material. He’s certainly been around the block. You put an acoustic guitar in his hands and a microphone in front of him and record whatever comes out. It ought to be intense, right? It is. Really intense. To the point where it gets really terrible. 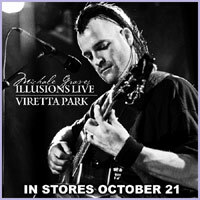 Michale Graves insists to get under your skin and very soon his very intense but not exactly fantastic voice gets to you and his guitar becomes monotony incarnate. And what is interesting is that the recording is very honest. You get the scratchy sounds when Michale peaks and the channels of the sound board are not ready for it. Hell, you even get the murmur of the folks that couldn’t care less about <?xml:namespace prefix = st1 ns = "urn:schemas-microsoft-com:office:smarttags" />Graves’ churning out his feelings on stage. For die-hard fans of The Misfits only – and I do mean die-hard!